Find helpful documents and an FAQ to help answer your questions about Chicago Shares. Below are documents that may help you get connected with Chicago Shares. 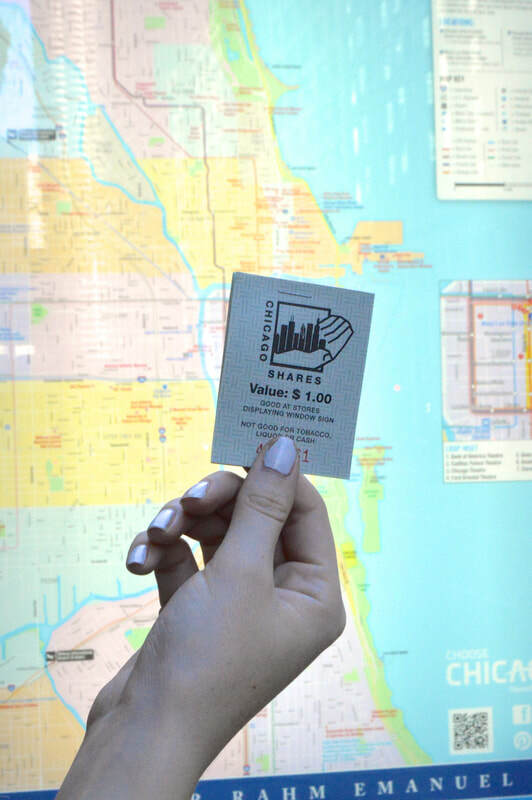 Chicago Shares Procedures This includes information for merchants interested in accepting Chicago Shares vouchers and organizations that want to sell Chicago Shares vouchers. How to Start a Shares Program Could your city or town benefit from a program like Chicago Shares? Here is a thorough manual that guides you through starting a Shares program in your community. We are available to answer any and all questions you may have. Feel free to contact us and we will get right back to you. How does the voucher system work? People buy our vouchers online or from one of our partners. Each voucher is worth $1. They give the vouchers to someone in need. The person in need redeems the voucher from a participating location for food or personal care item. Vouchers are not valid for alcohol or tobacco items. We reimburse the participating location $1 for each voucher that is redeemed at their location. Not all vouchers given to those in need are redeemed, so the funds from those go toward giving annual grants to other Chicago organizations that feed the hungry. Where can I buy vouchers to give the hungry? Mail in an order form with a check. Purchase vouchers from one of our partners. Note: each location sells our vouchers at different times. Contact them directly if you’d like to purchase vouchers from them. How do I sign up to sell or redeem vouchers? Contact us and a Chicago Shares representative will get in contact with you. I want to volunteer for Chicago Shares. How can I help? We’re glad you asked! One of our biggest needs is enlisting local merchants across the city to accept Chicago Shares vouchers. We may have other volunteer opportunities available, so please contact us if you’re interested and a Chicago Shares volunteer will get in touch with you. What can people purchase with the vouchers? Vouchers can be redeemed for food and personal care items. Alcohol and tobacco products cannot be purchased using Chicago Shares vouchers. ​¿Qué es “Chicago Shares” – Chicago Comparte? Chicago Shares es una corporación sin fines de lucro cuya misión es proveer una forma para que personas, organizaciones, comunidades religiosas, corporaciones y comerciantes minoristas puedan ayudar a los que padecen de hambre en el área de Chicago usando un sistema de vales/cupones. Residentes de Chicago pueden estar seguros que sus donaciones son para darle de comer a alguien usando vales/cupones de $1 en vez de dinero en efectivo. Los cupones de “Chicago Shares” son seguros, convenientes, y fáciles de usar. Permiten a la gente generosa de Chicago que ayude a los necesitados de una manera digna. “Chicago Shares” reembolsa a las tiendas participantes $1 por cada cupón que es redimido en su locación. No todos los cupones que se dan son redimidos. Estos fondos van hacia donaciones a otras organizaciones de Chicago que ayudan a alimentar a los que necesiten comida. ¿Dónde puedo comprar los vales para dar a las personas necesitadas? Envíe la forma de pedido de “Chicago Shares” con un cheque. Chicago Shares se inició en 1993 en la Catedral Holy Name en Chicago. Cada año, más de $40,000 en cupones son redimidos de nuestros proveedores participantes. Chicago Shares siempre ha sido un programa de voluntarios, no hay trabajadores contratados. Para más información sobre locaciones donde usted puede comprar cupones de Chicago Shares y donde se pueden usar (mas información sobre cómo ser un voluntario o un comerciante), favor de enviar un email a chicagoshares@gmail.com.